Infrared burners are the latest craze in grilling and do offer some real advantages. Infrared burners are capable of reaching much higher temperatures and cooking your food much faster. Still, these grills are more expensive than regular gas grills on the market. You may be wondering, are infrared grills really better than gas grills? Here's a look at the truth behind infrared grilling and why you may be better off with regular grill parts. Infrared burners focus the flame from a normal gas burner onto a ceramic tile, converting the flame's heat into infrared energy. Infrared grills are capable of much higher heat although they can't do low temperatures well at all. There are dozens of types of infrared burners and grills for sale today with many types of technology in use. The original inventor of infrared grills, TEC, has a burner that emits 100% infrared energy by putting a gas burner under stainless steel emitters that prevents airflow, cooking food only with the radiant heat. There are some styles of infrared burners that also produce hot air, or convection, with around 50% infrared. Char-Broil remains the most popular infrared grill manufacturer and their infrared grill parts are often seen as superior and the most affordable. Do Infrared Grills Really Sear Meat Faster? Most infrared grill manufacturers claim their infrared burners sear meat faster than gas grills with quicker cooking time and locked-in flavor. There is one problem with this promise: searing does not actually lock in the juices in the meat but instead causes the surface to caramelize and brown. Browning occurs between 300 and 500 degrees F, while infrared grills create a cooking surface that's over 700 degrees. To really sear meat, the ideal cooking temperature can be achieved with regular gas grill parts, not expensive infrared grills. Another problem with infrared grills is the learning curve, as they create so much power and intensity it can be tricky to grill fish and vegetables. Don't expect amazing results the first few times you use an infrared grill as it's easy to burn the food. You want to aim for only 1 minute per side at the maximum temperature before moving the food to a non-infrared burner on the grill or lowering the temperature a lot. Remember, browning and searing occurs below 500 degrees F while infrared burners reach over 700 degrees in 7 minutes. This makes it much easier to burn or char your food, which creates carcinogens (cancer-causing substances). While infrared grills can be entirely safe to use, it's important to watch your food carefully as it cooks to avoid burning. Finally, infrared grills can be very costly, both to buy and to repair. Because these grills are still seen as using state-of-the-art technology, expect to pay hundreds more for an infrared model than a regular gas grill. The replacement grill parts for these models can also be much more costly and, if you can't do the repairs yourself, a technician will cost quite a bit. 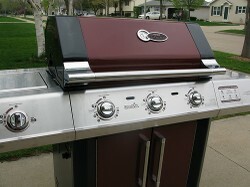 Gas grills, on the other hand, are very simple and affordable to repair and most gas grill parts cost under $30. While infrared grills offer some great advantages like fast cooking and high heat, keep in mind the learning curve and cost before you make the decision to buy one. Finally, remember the claims by many infrared grill manufacturers are misleading as these grills can't actually sear meat more effectively than a regular propane grill.